2019 has well and truly arrived and we think this year might be the year for dairy to take charge when it comes to product innovation. The dairy category in general has been trending ever since studies indicated the lower health risks from consuming dairy-fats. Essentially, high-fat dairy enriched diets are in and low-fat diets are old news. However, today’s consumer expects more bang for their dairy buck which has driven significant innovation in this category. Here’s your guide to the top dairy trends which will be hitting the menus and dairy aisles this year. Move over ‘brown butter’ gourmet flavoured butters are here to stay. It’s not ‘just’ butter anymore, flavoured butters will really gain momentum in 2019. We’re not talking about the ‘brown butter’ trend, that’s yesterday’s news… Think sweet and savoury flavoured butters such as honey, pistachio, jalapeno, lemon zest, pumpkin seed and even seaweed flavoured butters! Chefs have been taking butter to new flavour places for a while now but in 2019 we’ll see food companies answering consumer demands and providing packaged flavoured butters sold at retail for convenience. Believe it or not that’s what you will be hearing in coffee shops around the nation this year. First it was butter coffee, commonly referred to as ‘bulletproof coffee’ and now cheese coffee is the latest fad which barista’s all over the world are catching on to. Cheese in coffee has a similar texture to marshmallows in hot chocolate, the cubes of cheese float to the top and absorb the coffee developing a squeaky texture. It doesn’t stop there though; cheese tea is also a trend which we expect will become mainstream by the end of the year. The cheese tea trend started in Asia, then moved to the United States and will finally hit Aussie shores in a big way this year. Cheese tea is usually served with either green or black tea and topped with a thick layer of salted cream cheese. As the cheese melts on top it forms a similar texture to melted ice cream with a salty tang. The protein trend has taken many food categories by storm, but we believe the dairy category presents numerous opportunities to satisfy these protein savvy customers. 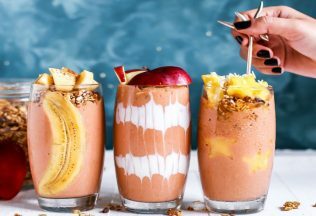 Once just a trend amongst the health-obsessed millennials, this trend has extended to families with children as well as senior couples who are also putting high-protein foods into their shopping trolleys. We’re now seeing high protein yoghurts, ice cream and convenient snack products which fit into the ‘on-the-go lifestyle’ of so many consumers these days. New dairy proteins make formulating protein-fortified products even easier. We’re now seeing a completely new category for protein emerging because a form of whey protein which can function in clear beverages is now available. Consequently, ‘Protein Waters’ is a category which is growing at a rapid rate. Furthermore, consumers are becoming more aware of the importance of gut health and the benefits of the fermentation process. Nutritional ingredient companies have been quick to respond to this trend and are now offering a whey protein isolate with prebiotic-promoting properties, tapping into the interest in the gut microbiome.